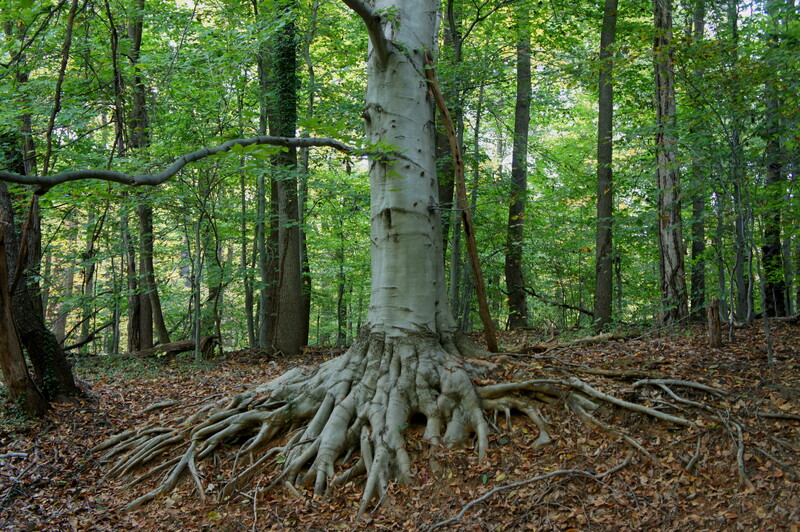 While its namesake viewpoint is no more, Potomac Overlook Regional Park in Arlington, Virginia still offers a couple miles of unpaved hiking trails through a diverse deciduous forest. 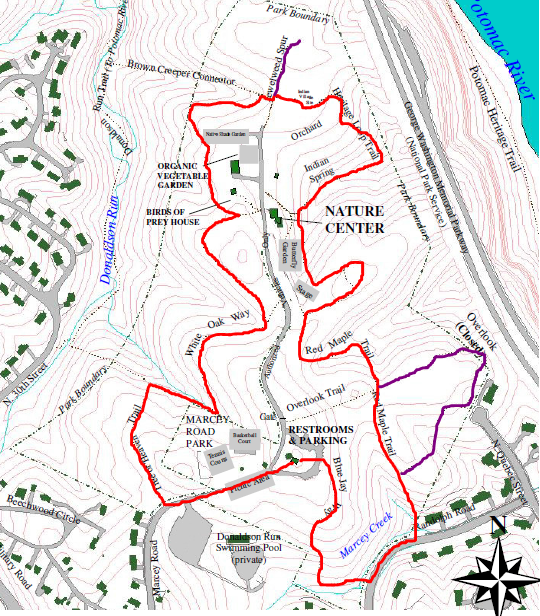 A combination of five different trails forms an easy-to-moderate circuit around the park that clocks in at around 1.6 miles. Access is from the restrooms and parking area off Marcey Road. 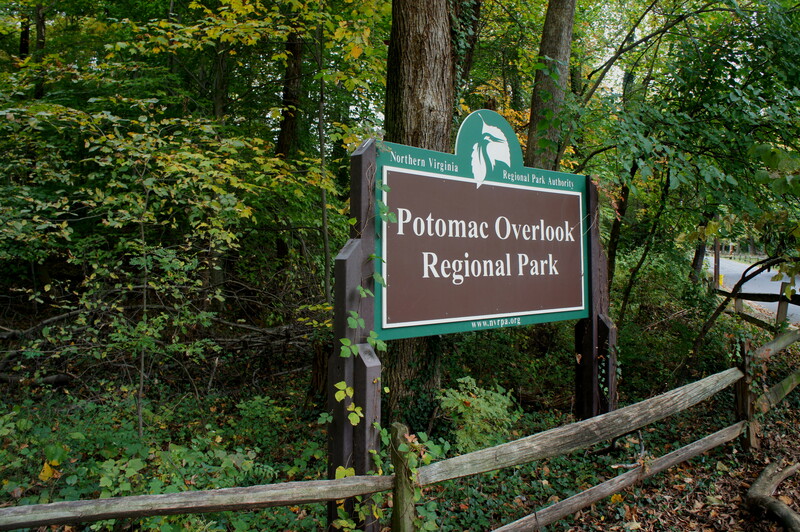 Marcey Road, situated off the Military Road in Arlington, provides the one and only vehicle entrance to Potomac Overlook Regional Park. The restrooms/parking area—located across the street from Marcey Road Park’s tennis and basketball courts—are reached after 1/3 mile. Park here to begin the hike. From the parking area, look east for the start of the unpaved Blue Jay Way trail, marked—unsurprisingly—with blue blazes. 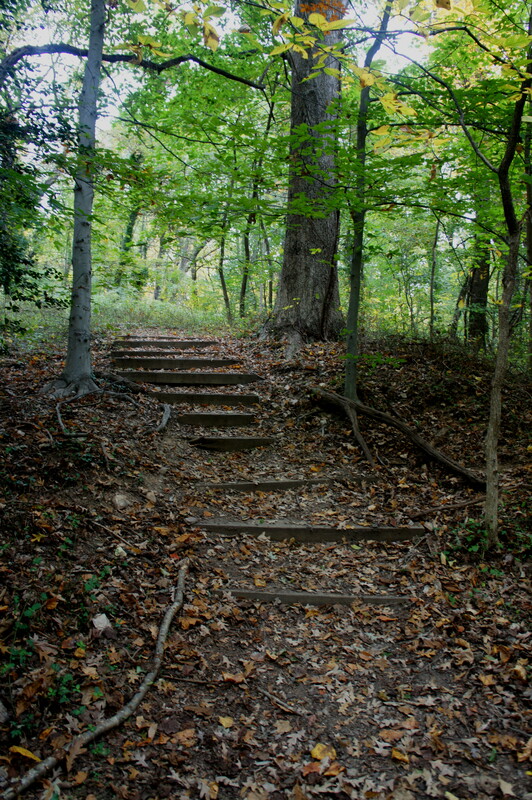 Humming to the Beatles tune, take off down the trail, which quickly drops down two sets of a dozen wooden steps. After a few minutes, the root-laden path passes a spur trail (heading to Donaldson Run Swimming Pool) and meets Marcey Creek, where Blue Jay Way bends east without crossing the stream. 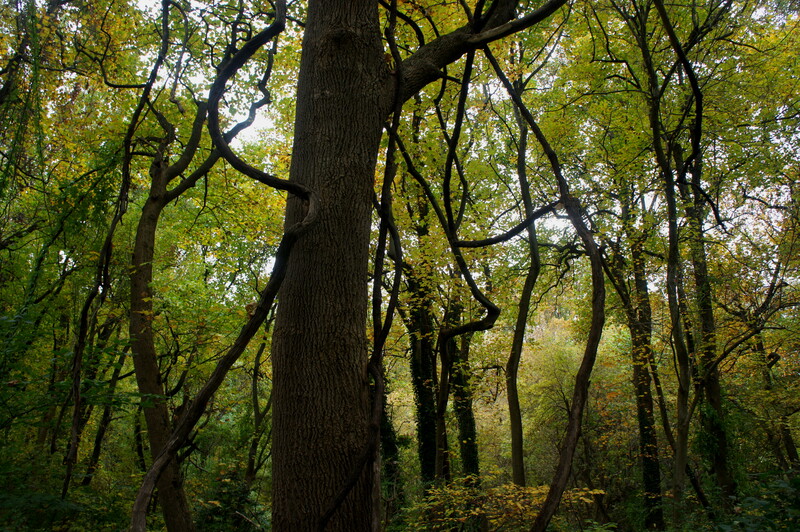 Dense tree canopy gives this section a dark and perhaps gloomy feel, which does not let up until the path spits out onto Randolph Road. Less than 1/10 mile past the first junction, the Red Maple Trail intersects the Overlook Trail again; continue straight at the fork. The path thereafter ascends a minor ravine, approaching an open field before skirting around to the east. Stay right at the first junction, continuing on to the Donaldson Cemetery, now disinterred but once the resting place for the family that previously owned and tilled the land on which Potomac Overlook Park now sits. Winding west, then north, the trail passes behind the butterfly garden and nature center (blue building on the hill). Stay right at the fork, starting on the green-blazed Heritage Loop Trail. 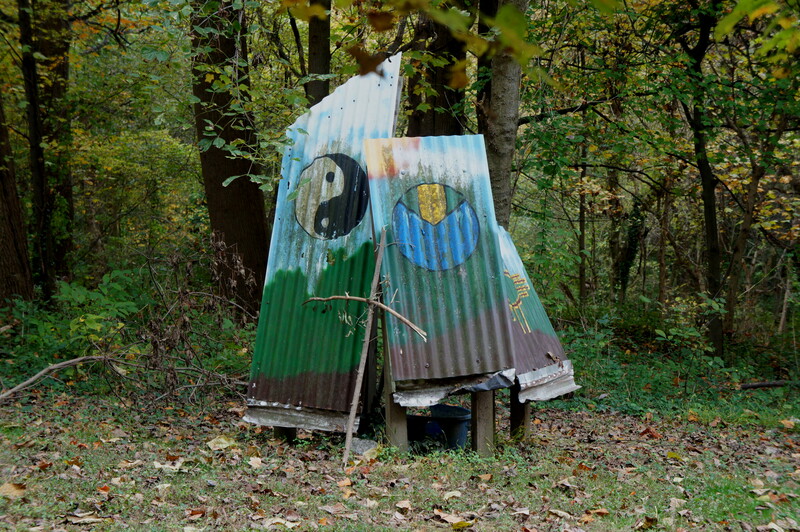 True to its name, this short path features a number of waysides hearkening back to the area’s past, including a stop at Indian Spring (the Donaldsons’ source of water) and the site of a seasonal Indian camp dating to circa 500 BC. A few steps beyond the gardens is another trail junction—the short and relatively uninspiring Jewelweed Spur takes off to the right. Continuing straight, the trail forks again; bear left onto the “White Trail,” or—as the map labels it—White Oak Way. White Oak Way is perhaps the best of the trails on this route to see stands of tulip poplars—tall, skinny trees rising high above the rest. 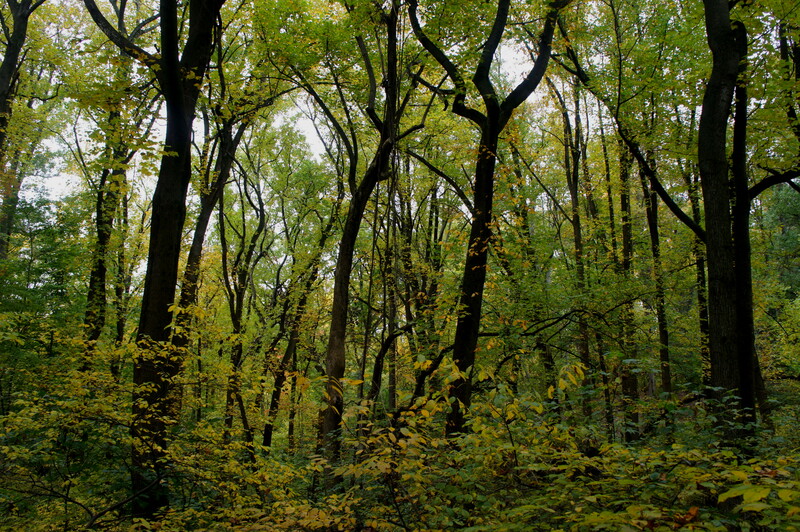 There is also a good collection of red maples, beeches, and, of course, white oaks. 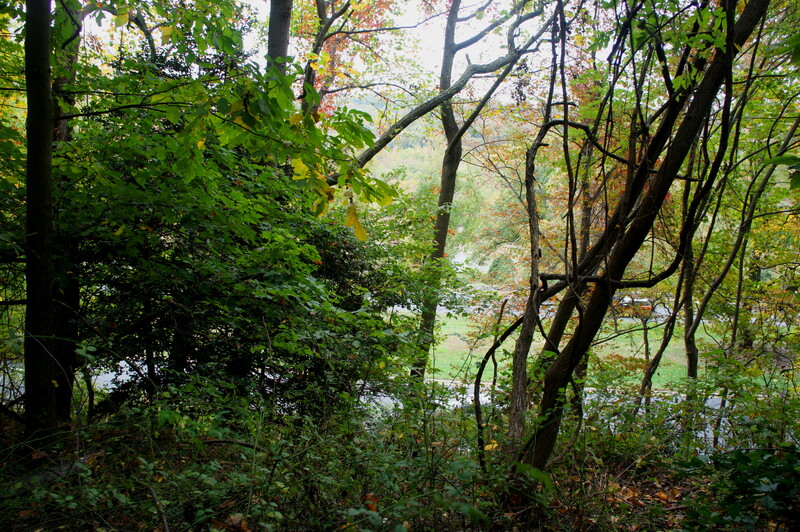 The 4/10-mile trail weaves past a series of minor ravines and offers occasional peeks down to Donaldson Run below. Stay right at the next three junctions, the final marking the end of White Oak Way and the start of a connector route to the Donaldson Run Trail. Follow this route across two tiny wooden bridges, over a small crest, then down a hill to the first trail junction. It is important to turn left at the first opportunity; if you reach a small bench and a second junction, you’ve gone too far. 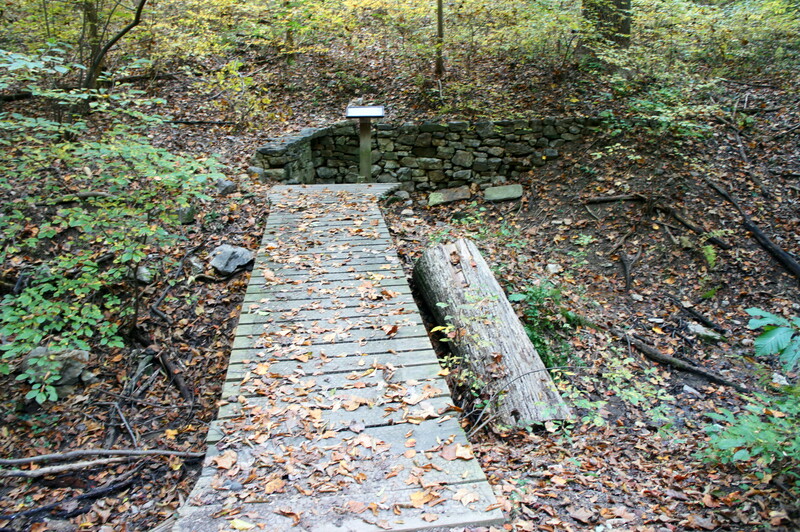 (Note: Several other trails lead down toward Donaldson Run.) The correct trail—the Tree of Heaven Trail—remains high up on the shelf, passing immediately through an area swimming with vines and spindly branches and presumably encountering the route’s namesake (not sure which tree it is). Before you know it, you’re back on Marcey Road at the entrance to Potomac Overlook Park; head left on the road for 1/10 mile to reach the original parking area. Allot around 1-1.5 hours for the round trip, and bring a map, as trail signs and markers are scarce. 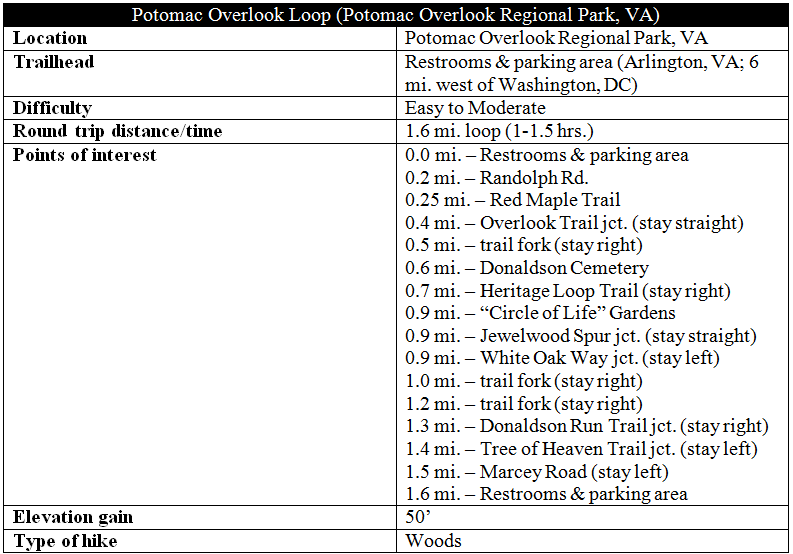 This entry was posted in Arlington County Parks, Easy Hikes, Virginia and tagged Arlington, Blue Jay Way, Donaldson Run, Heritage Loop Trail, Jewelweed Spur, loop hike, Overlook Trail, Potomac Overlook Regional Park, Red Maple Trail, Tree of Heaven Trail, Virginia, White Oak Way. Bookmark the permalink.